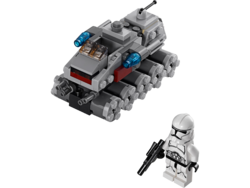 75028 Clone Turbo Tank is a Star Wars set released in 2014. The Heavy Assault Vehicle/wheeled A6 Juggernaut was a heavy assault tank heavily used in the latter stages of the Clone Wars, and was developed by Kuat Drive Yards. The tank featured many large laser turrets and cannons. The A6 was an upgraded version of the outdated A5 Juggernaut tank. Unlike its predecessor, the A6 was much larger and had an expanded interior allowing for more troops (up to 300) to be transported into battle as well as speeders and light airspeeders. It required a crew of twelve, but with an automation package, that could be reduced to only two pilots. It featured many weapons including rapid-repeating laser cannons, heavy-repeating laser cannons, anti-personnel laser cannons, and rocket grenade launchers, among many others. They were known to be used in the Battle of Kashyyyk as well as several other key battles during the Clone Wars. They were slowly phased out during the rise of the Empire, and were replaced by the HAVt B5 Juggernaut which was slightly lighter, however, some of the remaining A6s were utilized by the Rebellion. Some of the tank's features would show up in later generation AT-AT Walkers. This is a description taken from LEGO.com. Please do not modify it. 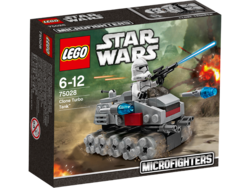 (visit this item's product page) Enter miniature battle with the LEGO® Star Wars™ Clone Turbo Tank™ microfighter! Facts about "75028 Clone Turbo Tank"
This page was last edited on 25 April 2016, at 08:43.